When Porridge was a wee kitten he toppled into a tin of tartan paint — which is easy to do and not so easy to say. Now he lives by Loch Loch with the quirky McFun family: Gadget Grandad, Groovy Gran, Dino Dad, Mini Mum and the twins, Roaring Ross and Invisible Isla. Everyone has a super secret — or two– and Porridge is always there to lend a helping paw when things go awry. If there’s a fishy biscuit in it for him…And things do often go awry in the McFun family. It’s a good job Porridge has nine lives! 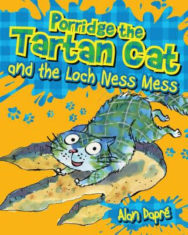 ————– Porridge the Tartan cat (it’s a long story involving a tin of tartan paint!) and the twins, Isla and Ross, are helping Dad dig for dinosaur bones at Loch Ness. But they end up digging up trouble instead. Dad has been turned into a dinosaur — and is captured by a Nessie-hunter! Will Porridge and the twins be able to convince dastardly Fergus McFungus that his prized Nessie isn’t really a Nessie at all? Can a fossil-finding, Nessie-riding cat help reverse Dad’s dino-isation and save the day? —————– In this zany new series for young readers, Porridge purrfectly CAT-a-logs the family’s hilarious adventures from a cat’s-eye perspective.With wacky twists, silly word play and meow-nificent illustrations in every chapter, readers won’t even want to paws for breath.